Gannon University provides ways for students of all backgrounds to express spirituality. Campus Ministry hosts events for faculty and students to get together and discuss their faith. The most popular event held off campus is Theology on Tap. Theology on Tap first came to Gannon’s campus in December 2010. Gannon started the event as a way for students to get off campus and mingle with others students who may or may not share their beliefs. Theology on Tap is a nationwide program model targeted at young adults. The lectures given, often by those who are most familiar with the subject, address current topics in religion, theology and issues with today’s society. It is a way for students to go off campus in a safe environment and engage in meaningful discussions about relevant topics on faith and college life. This year the events are put on by a group of student leaders — Kevin Paton, Phil Vargo, Alli Lee, Leanne Casserlie and Aaron Brown — who work together to come up with the topics, arrange the presenters and coordinate the events. According to Paton, a junior mathematics major, Theology on Tap is an amazing event that allows people from all different faiths to come together and enjoy a bite to eat while having meaningful conversations about life with other students. Another student leader, Brown, a sophomore pre-medicine/biology major, joined the team in hopes of helping spread the ideas of faith on Gannon’s campus. “I hope that through this whole process that I can be influential in someone else’s faith journey,” Brown said. “That through my work and efforts someone else may be able to begin digging their faith and personal well being”. 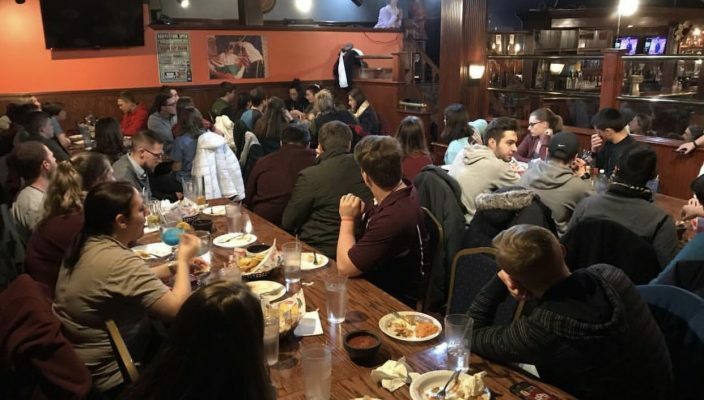 January’s Theology on Tap was hosted Monday night at El Amigo Mexican Grill on State Street. The Recreation and Wellness staff led a conversation on holistic wellness. Mary Taylor, Ph.D., the university’s wellness director, and Kaitlyn Falk, the wellness recreation coordinator, led the conversation. “How you choose to live can be an expression of your gratitude for God’s gift,” Falk said. Students who wish to attend the next event, set for Feb. 18, will meet at the Waldron Campus Center information desk and walk over as a group. Those who wish to attend do not have to be 21, but those who are of age are asked to bring their ID if they wish to consume. “The purpose is to create community in life, in faith and as a university,” Lee, a senior education major, said.